Take your best friend with you – it’s not as hard as you think! If you are like me, your pets are a part of your family and you want to take them with you as often as possible. Not just on trips, but to visit your friends and family, go to the park, to the drive through to get dinner… the possibilities are endless. About 3 years ago, my husband and I took our dogs, Sammy and Frostie, on a 20-hour road trip. I am embarrassed to say they scampered around the car, sat on our laps, hung their heads out the window from time to time, and overall really enjoyed themselves. My husband and I, not so much. We unsuccessfully tried to control them, we worried whether they were hungry or thirsty, struggled to walk them at each rest stop, of course forgot certain necessities (waste bags, for instance). I hadn’t previously put much thought into having any type of special accessories to make taking my little ones with me easier, but now that I am in the pet industry, I am sorry I didn’t have them sooner! In this article, I will mention only a handful of travel products available to choose from. Many of these items are so attractive you will want to leave them in your car at all times. Most are easily removed for storage and can be used when needed. What we did not consider a few years ago, we now know. 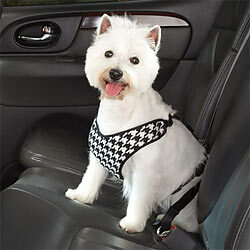 Dogs should be buckled up in the car the same as humans (or in some type of restraint, such as a crate). Crates are considered by many the safest means of transportation, but it s not always the most practical. Safety harnesses are growing in popularity and are considered a more convenient choice. There are all types of safety harnesses with a wide range of prices. Most safety harnesses average between $25.00 - $40.00. One can choose from a popular strap type or be more unique with a designer look. Some restraints may be considered safer than others. However, no matter what the safety rating, you have to use it in order for it to work. If you are like me, that means it has to be simple to use. Consider what will work best for the lifestyle of you and your furry friend. 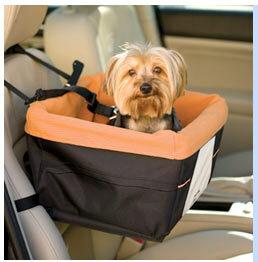 You will find most dogs easily adjust to a safety harness or traveling in a crate. If you have a smaller dog, a booster seat allows them to safely look out the window while being restrained in case of an abrupt stop. The Skybox Booster Seat by Kurgo has an adjustable strap to go around the headrest of your seat and a second strap to go around the seat back. A smaller strap attaches to your dog’s harness to hold him securely in place. The organization Bark Buckle UP reports that unrestrained dogs being killed in auto accidents are not just from impact, but also from running out of the car when help arrives and getting hit by a another car. Sometimes this even causes another accident. (For more information, visit www.BarkBuckleUP.com). In addition, an unrestrained dog is a distraction, and in the age of cell phones, we could use with one less distraction. At a minimum, whether you are going next door or on a cross country trip, you will need to remember to bring a good leash and waste bags. Having something to combine the two would make life easier, right? 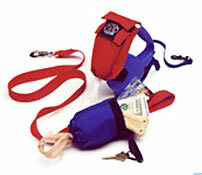 Leash Luggage does just that, plus gives you room to store your keys, money, room card. You can either use a roll of bags or recycle grocery bags (it will easily hold two). One of my personal travel favorites is the EBD (Everything But the Dog) Carryall Bag, which comes with an abundance of pockets inside and out and a huge fleece blanket with waterproof nylon on one side. 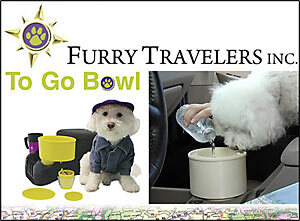 A travel food and water bowl are also included! I can keep all my travel supplies together in one place ready to go whenever I am. 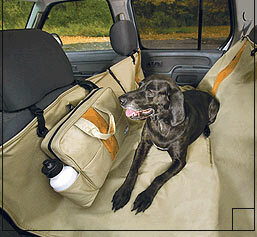 Car Hammocks protect your car seats from fur and wet or dirty paws and claws. They are generally made of some type of canvas and most are waterproof and of course washable. They come in neutrals to match car interiors or a variety of colors to match your personality. You can find a good quality hammock for approximately $60.00, although there are less expensive versions available. Proper hydration for both you and your furry traveler is always important, especially during the warmer months of Spring and Summer. Be certain to provide fresh water daily and have it easily accessible at all times. This will reduce complications (i.e. heat stroke) caused by dehydration. 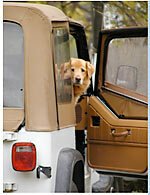 WARNING: Never leave your pet in an unattended vehicle! 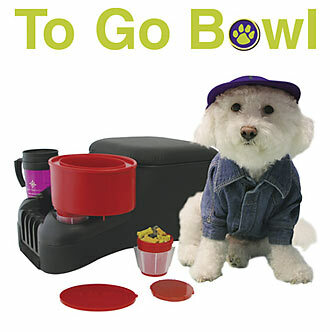 The To Go Bowl is available in 8 colors and works in any console cup holder, including RV’s, Boats, and even Golf Carts! It is dishwasher safe and made in the USA. Now I know traveling with pets does not need to be a stressful ordeal. The ever growing pet industry has a plethora of products targeted to pet-loving people that want to take their best friends with wherever they go.